We’ve all seen it: the blue label with white cursive writing and a star behind it. ENERGY STAR® has served as a trademarked standard in energy-efficient consumer related products for over 20 years. Light bulbs are awarded an ENERGY STAR approval rating if they meet or exceed the qualifications on a list of lighting standards. While these are not all of the standards for ENERGY STAR, light output, energy efficiency, and life-span are vital guidelines that must be met. Let’s take a closer look at these light bulb standards and how they work. ENERGY STAR rated lighting is commonly found in compact fluorescent lights (CFLs) and light emitting diode (LEDs) sources. Both CFL and LED lighting are considered to be energy-efficient forms of lighting when compared to incandescent lights. 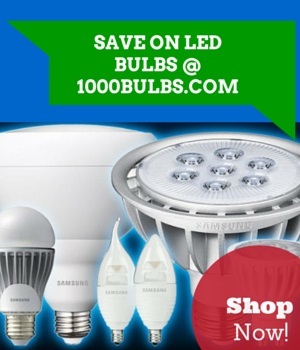 CFLs for example, use approximately 75% less energy than standard incandescents, while LEDs use up to 90% less energy. Rated bulbs meet incredibly stringent rules that were created by the United States Environmental Protection Agency or the EPA. The EPA is a government agency that works to protect humans from environmental health risks by implementing laws approved by Congress. In order to be ENERGY STAR rated a light bulb must meet certain light output requirements. Although it is a common misunderstanding, brightness of a bulb is measured by lumens not by watts. Basically, the higher the lumen output, the brighter your bulb will be. Lighting that comes packaged with a rating which includes wattage equivalency explains that they emit at least as many lumens that can be found in standard incandescent lamps. It should be noted that not all light bulb manufactures agree on wattage and lumen equivalency. However, ENERGY STAR rated light bulbs do hold incredibly stringent standards for qualification. For instance, a 25W equal bulb must emit at least 250 lumens, the standard amount for most incandescents to be considered ENERGY STAR qualified. See the chart below for more details. As we’ve learned in previous posts, not all energy efficient light is created equal. Some bulbs are less efficient than others. For a CFL or LED to meet ENERGY STAR standards, the light must emit a certain lumens per watt. These certified bulbs use less energy than regular or standard incandescent light bulbs. For example, an omnidirectional lamp that uses less than 15 watts must emit at least 55 lumens per watt to be ENERGY STAR rated, and a directional lamp that uses less than 20 watts must emit at least 40 lumens per watt to qualify. It should be noted that light outputs differ for different categories. While most requirements are measured in lumens, PAR and MR bulbs standards are measured by candlepower since they emit a directional light which is concentrated in the center. In addition to maintaining energy efficiency and lumen life, the bulbs must maintain a certain lifetime criteria. A certified ENERGY STAR CFL lamp will likely last 10 to 25 times longer than non-ENERGY STAR certified bulbs. For example, rated CFLs must have a bulb life minimum of 10,000 hours, 15,000 hours for decorative LED bulbs and 25,000 hours for additional LEDs. Lighting that does not meet this lifetime criteria or better will not be considered for an ENERGY STAR rating. Other factors that are considered by ENERGY STAR for light bulb qualification include CRI, dimming capabilities and lumen maintenance. LEDs must have a CRI that is greater than or equal to 80. Dimness is thoroughly tested and lamps must maintain a maximum and minimum light output when placed on a dimmer. Flicker and noise are also tested and they have to dim at 20% or lower. CFLs must maintain greater than or the equivalent of 90% of initial lumen output within 1000-hours. After a 6000 hour test, LED bulbs have to maintain a certain light output to qualify. For all lamp qualifications, visit ENERGY STAR. Hope this helped you learn a little more about ENERGY STAR rated lighting. Have any additional questions or comments? Feel free to leave a comment below, or send us a message via Facebook, Twitter, Google Plus, LinkedIn, Pinterest, or Instagram!